It’s 11:00 a.m., Easter weekend, March 1967. I’m in a cramped, dressing room at the RKO, 58th Street in mid Manhattan. Circa 1940s furnishings, grimy windows, daylight filtered through the fire escape outside. Keith Moon is lying on an old ratty sofa with a beautiful young woman while taking swigs off a bottle of Jack Daniels. I was 17 at the time, he was 20. I’d just been introduced to Keith, Pete Townshend, Roger Daltrey and John Entwistle. I felt like I’d passed into another realm, the place where real British rock stars hung out. The universe had shifted slightly. A new dimension was revealed. I was looking through a window into the grit of creativity itself. 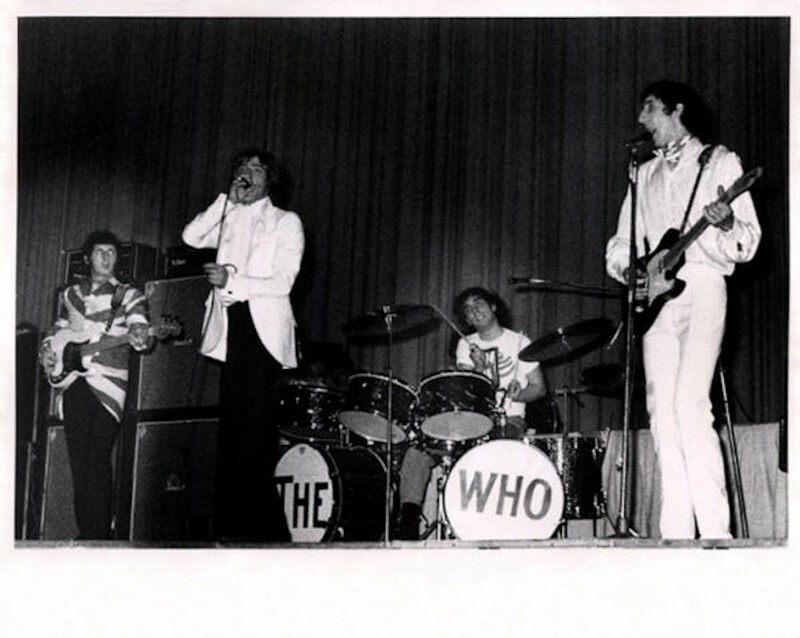 My fellow aspiring musician pals, Howie Weintraub, Chuck Fitzgerald, Josh Lipton and I were there that day with the Who through an odd set of connections, witnessing a surreal, and as it turns out, historic event. 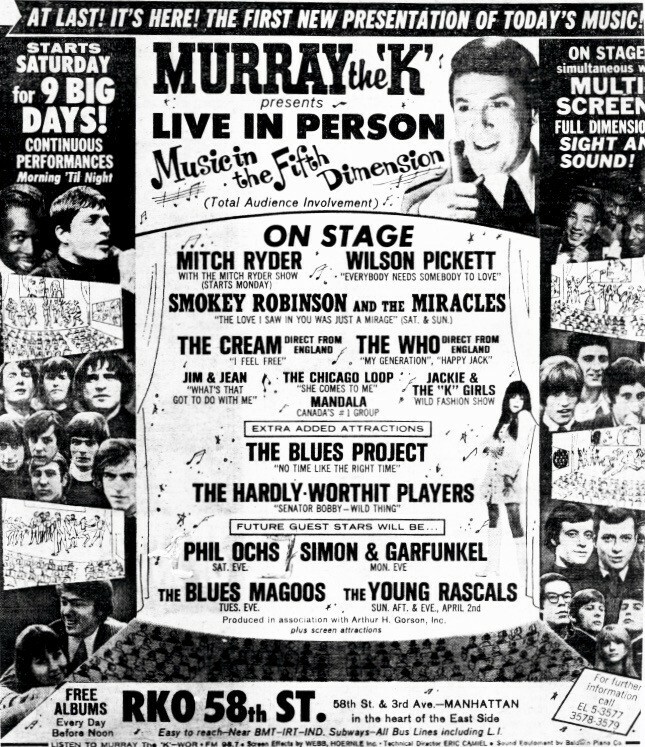 We were backstage at New York DJ legend Murray The K’s “Music In The Fifth Dimension” series of all-day concerts featuring the first US appearances of The Who, Cream (billed as The Cream), The Blues Project, Wilson Pickett, Mitch Ryder, The (Young) Rascals and others. The format for the shows was based on Murray The K’s soul reviews of the ‘50s and early ‘60s at the Brooklyn Fox Theater, where each act would come out and do two or three songs, starting mid-day and ending late in the night, in constant rotation. Everyone got to go on many times a day for a very short time. Needless to say this did not go down well with the Who. We gob-smacked lads hung out, talked music, guitars, amps, fuzz tone pedals (new at the time) and had free reign of backstage as long as we kept out of sight of Murray. Forever etched in my memory is the moment we asked them to play “I Can’t Explain,” our favorite single at the time. Thinking they’d never listen to us, we were blown away when they came out and did it for their first song. In the midst of all of this we ran into Eric Clapton, Ginger Baker and Jack Bruce, bedecked in psychedelic pastel outfits. We chatted with Eric about his pure guitar tone on “I Feel Free.” He had no idea how he got it — somebody gave him a box that he plugged into he said. Amazing! The experience left its mark on me. Being so close to inventive people willing to take risks and deliver extraordinary experiences that had never been seen before continues to inspire me and the work I do. Today, I’m still on the lookout for the brave, inventive soul of the ‘inner Who.’ I look for it in my work with leaders and teams, in both new and established organizations, to find opportunities to help them make their ideas feel vibrant and alive. Alive with the same urgency I felt that Easter weekend. My Generation is still playing in my head, can you hear it too?